Starring: Steve Evets, Eric Cantona, Stephanie Bishop, Gerard Kearns, Stefan Gumbs, Lucy-Jo Hudson, Matthew McNulty, John Henshaw. The master of British working class cinema Ken Loach, offers up a more light-hearted little film in the wake of his hard hitting Irish revolutionary film “The Wind that Shakes the Barley”. Eric Bishop (Steve Evets) is a 50 something postman who’s life has taken a serious downturn. He is plagued with regrets of his past, in abandoning his first wife and newborn baby and now struggling to manage his teenage sons from his second marriage. One of his outlets for fun is following his beloved football team Manchester Utd and it’s from the past years of this succesful team that he is given some life coaching and guidance from none other than Eric Cantona, the French footballing sensation who is also famous for his philosophical ramblings. A far more uplifting film from Loach than his usual depictions of the british working class. This still has the gritty realism of his previous work but he’s concentrated more on the humorous aspect of his and writer Paul Laverty’s talents. 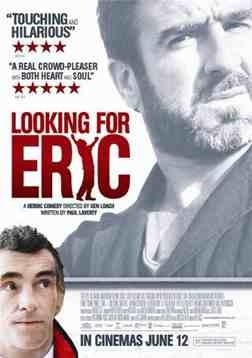 This is all helped perfectly by an excellent lead performance by Evets as the downtrodden, angst riddled father and despite Cantona being no thespian, he manages to add a surprisng amount of humour to the film. An enjoyable way to spend an hour or so but I think I still prefer my Loach films, less poached and more hard-boiled. This entry was posted on January 18, 2012 at 11:17 pm and is filed under Comedy, Drama with tags 2009. You can follow any responses to this entry through the RSS 2.0 feed. You can leave a response, or trackback from your own site.